The Mediterranean, Aegean, and the Black Seas, as well as the Sea of Marmara, surround Turkey to the north, west and south. With over 8333 kilometers of coastline and four seas, Turkey is a treasure chest of coves, inlets, bays and beaches from which yachtsmen can choose a different and always private anchorage each night. The sailing paradise of Turkey is home to the Blue Voyage.This idyllic cruise means sailing with the winds, into coves and over the seas and becoming one with nature. It is also an experience of the history of man from the perspective of the sea rather than from the land, a journey which carries you to the private beach of Cleopatra, the eternal fires of Mt. Olympos and the myriad archaeological remains of ancient civilizations. For lovers of the active life, sailing in the clear waters provides the opportunity for swimming, fishing, skiing, surfing and diving. Sailing in Turkey also allows you to experience a truly enriching cultural exchange with the hospitable and gracious people of the coastal villages and towns. The tempered winds which generally blow from the west and northwest make the long summers ideal for yachting and seem to encourage an appreciation of nature. From some of the turquoise coast’s unspoilt and sheltered bays you can see mountain peaks rising to almost 3000 meters above sea level. Fortunately, Turkey’s modern facilities and comfort have not overshadowed her ancient hospitality and slower pace of life. The pleasure of yachting in Turkey will tempt you back again and again, to explore yet another stretch of coast and to relive the luxurious ease of life on the sea. Yachting remains a popular activity for residents as well as visitors to Turkey. Over the past 40 years the industry has grown, and today a large number of marinas dot the coastline between Istanbul and Antalya. These provide supplies, easy access to the shore at major resorts, and safe harbours as well as often becoming local entertainment venues in themselves. In Istanbul, yachtsmen will delight in splendid natural landscapes, open seas and magnificent sunsets, as well as a voyage through Byzantine and Ottoman history as they sail past the impressive castles, palaces and mosques. After navigating the breathtaking Bosphorus and sailing under the two enormous bridges which span Europe and Asia or meandering along the mosque-lined Golden Horn or cruising in the coves and bays of the Princes’Islands, you can return to one of the two large marinas in the area. Ataköy Marina on the European side and Kalamis (Admiral Fahri Korutürk) Marina on the Asian side both offer 24-hour service. From the North Sea through the European interior, yachters can sail down the European channel system and the Rhine and Danube Rivers into the Black Sea harbours and to the Istanbul Bogazi ( the Bosphorus) and Istanbul marinas – a safe and short way to go to the Turkish Meditterranean coast and Marinas. The Black Sea coast provides yachters with a lush green coastal band where the environment is protected and virginal. There are frequent coves and fishing harbours along this coast, and the weather is mild during the summer and winter. Turkey’s most established marinas lie on the southern Aegean and Mediterranean coasts at Izmir, Çesme, Kusadasi, Bodrum, Datça, Bozburun, Marmaris, Göcek, Fethiye, Kalkan, Kas, Finike, Kemer and Antalya. In these well equipped harbours, yachters can find the services and provisions they require. Antalya, Dalaman, Izmir, and Istanbul airports provide quick links to all of Turkey’s marinas; after an easy flight you can board your yacht and sail off all within a day. The singular design of the Gulets, Turkey’s indigenous sea- going vessel, blends practicality and tradition in a relaxed style that embodies a Blue Voyage. Over the years Gulets have evolved from traditional crafts for fishing and transport into their present profile with a broad beam and wide deck. Constructed mainly in shipyards in Bodrum, Bozburun, Marmaris, and Istanbul, and along the Black Sea Coast, the boats are equipped with motors as well as fully functional rigging. The number of passengers a gulet carries depends on the boat’s size, although most of them accomodate between eight and twelve people. These vessels offer their passengers separate accommodation, and chartering one includes services and entertainment. Modern Gulets are comfortably equipped with all the amenities of home and encourage an environment in which you are expected to do nothing but enjoy yourself. The closeness of the small group of people on board promotes an atmosphere of friendshipand sharing; relations among passengers and crew tend tobe relaxed and casual. Travel agencies can arrange charters and fixed tours for a specific group of people or for you individually. Unlike cruises in large ocean liners,on a Gulet you can explore the secluded and often deserted bays and coves of the coastline. The small harbours and settlements offer an intimate view of coastal life which large ships can not replicate authentically. In many ways a gulet is like a full-service hotel where every room has a sea view and the scenery changes constantly. Bare-boat charter has recently been introduced as another form of yacht hire in Turkey. The Charters are undertaken by representatives who are responsible for putting the passengers on board, looking after them and seeing that they return safely to port. Maintenance crews keep these yachts in optimum condition, but it is the people who undertake the charter themselves who crew the boat. Of course, an experienced skipper accompanies the vessel, but once on board the people who undertake the charter perform all of the tasks – the handling of the sails, the seaman’s chores, meal preparation and housekeeping. For those want to escape all kitchen duties on their holiday there is at least one restaurant at every anchorage; eating out remains an option. The more adventurous and experienced sailors can charter and pilot smaller(9 to 10 meter) motor yachts. Before setting sail, bare – boat companies generally brief their clients on the navigational characteristics of the environment, meteorological conditions, where and how to restock provisions, how to act in an emergency and any other pertinent information. Flotilla sailing, or sailing with a group of yachts led by one boat, is another great adventure on the sea. Although an experienced sailor skippers the lead boat, the navigation of each individual boat is left to its crew. Known in Turkish as “Beautiful Izmir”, the city lies at the head of a long and narrow gulf furrowed by ships and yachts. The climate is mild, and in the summer the constant and refreshing sea breezes temper the sun’s heat. Behind the palm-lined promenades and avenues which follow the shoreline, the city, in horizontal terraces, gently ascends the slopes of the surrounding mountains. A cosmopolitan and lively city, galleries, theaters and cultural events give Izmir its special vibrancy. The original settlement was established in the third millennium B.C. and represented the most advanced culture in western Anatolia at that time. Over the years this thriving city and the surrounding area had come under the suzerainty of the Hittites, Ionians, Lydians, Persians, Byzantines, Seljuks, and Ottomans. Levent Marina provides an excellent place to begin a yachting adventure. Sailing in and around the beautiful Gulf of Izmir will prepare voyagers for the wonderful sites that lie ahead. At Urla Iskelesi, the small islands that dot the coast will certainly charm you. Beautiful beaches and excellent moorings with swimming, snorkeling and diving are all available in the area. From Urla Iskelesi sail on to the Karaburun Peninsula. At Karaburun, pleasant hotels, tea gardens and fish restaurants sit between the beautiful mountain backdrop and the clear, clean water. Voyage out of the Gulf of Izmir around the Karaburun Peninsula to the Cesme Peninsula, a spit of land lapped by the waters of the Aegean Sea. Çesme , meaning “fountain”, derives its name from the many sources of water found in the area. A 14th – centuary Genoese fortress, restored and enlarged by the Ottomans in the 16th century, dominates the small port of Cesme. Around Cesme, the large Altin Yunus Setur Marina complex and the berthing places of Ilica and Dalyan are all noted for their safety. In town, the 16th century caravanserai built by Suleyman the Magnificent near the fortress, has been converted into a hotel. Excellent shopping s the finest quality carpets, leather goods, as well as souvenir items – is available. At night, a lively, fun atmosphere pervades, especially in the restaurants, cafes , bars and discos along the promenade. In July, Çesme’s International Song Contest attracts world famous performers who add glamor and excitement to the town. The thermal baths in the area, along with the natural springs found right off the coast and which mix with the sea water in Ilica Bay, provide soothing relaxation. Southeast of Çesme, beautiful bays offer splendid scenery and tranquil night moorings in complete safety from the winds and waves. Soon you will arrive at Sigacik, where a picturesque marina rests beneath fortifications that date from the Genoese period. From here, the antique site of Teos, noted for its temple of Dionysus, the god of wine, is conveniently close. It is also an excellent area in which to sample some of Turkey’s superb wines. The Kusadasi Gulf opens to the south and southeast with some of the most enticing beaches, bays and coves on the Aegean coast. Kusadasi is today a major holiday resort – center. During the summer months it teems with swimmers, fishermen, sunslovers and sightseers. Once known as Scala Nova, the town boasts wonderful seafood restaurants, cafes, beautiful parks and superb beaches. The shopping is also famous; everything from beads and bangles to leather, jewelry and carpets is on offer. The Kusadasi Turban Marina is one of the bestsequipped marinas in Turkey, providing wintering for boats both afloat and on shore. Scuba diving has become very popular. The night life is renowned along the coast with excellent bars, jazz clubs, discos and cabarets that promise evenings filled with excitement, entertainment and possibly a little romance. Not far from Kusadasi, the ancient site of Ephesus, an important city of antiquity, remains a highlight of any visit to Turkey. The city, whose whealth and patronage supported its splendid architectural program, was dedicated to the goddess Artemis. Her enormous temple, rebuilt several times, dates in its latest form from the third centuary B.C. and was considered one of the seven wonders of the ancient world. The ancient theater has found new life as a major concert venue. Close by is the site of St. John’s Basilica and reputed last home of the Virgin Mary. South of Kusadasi, the unbelievably beautiful waters of the Dilek Peninsula National Park welcome yachtsmen into its serene inlets and coves. Between Kusadasi’s southern shores and Pamukkale lies the valley of the Menderes River (the Meander), where several ancient civilizations built major settlements, including Priene, Milet, Didyma, Aphrodisias and Hierapolis. This gulf can provide a whole vacation in itself with four large natural bays and numerous coves and inlets. The whole area has excellent moorings, and scuba divers will be particularly interested in exploring these waters. The fisherman’s village of Güllük has a pretty port and numerous guestshouses and small hotels. The mythological Dolphin Boy is said to have been born a little farther to the north at Kiyikislacik(Lassos). 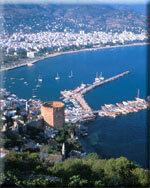 As you sail out of this beautiful gulf, the Bodrum Peninsula welcomes you. Bodrum, on the north shore of the Gulf of Gokova, was the home of the first “Blue Voyager”, Cevat Sakir Kabaagac or the “Fisherman of Halikarnas”. It is the undisputed “hot spot” of the Aegean Coast. This swinging, singing, dancing town, with its bohemian atmosphere, gathers together Turkey’s artists, intellectuals and lovers of the good life. An impressive medieval castle built by the Knights of Rhodes guards the entrance to Bodrum’s dazzling blue bay, in which the Aegean and the Mediterranean seas meet. 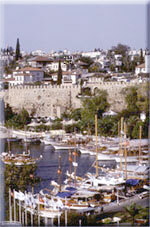 The Bodrum Castle now houses the Museum of Underwater Archaeology. Known in ancient times as Halicarnassus, Bodrum is the birthplace of Heredotus and the site of King Mausolus’s Tomb (4th centuary B.C. ), one of the Seven Wonders of the ancient world. The yearly throng of visitors has encouraged small entrepreneurs who have made shopping in Bodrum a delight. Souvenirs abound, and on certain streets local artists gather to sell their works – works that come in all forms. The Bodrum Turban Marina is one of the loveliest and best – equipped marinas in the region. A yachting tour of the Gulf of Gokova starts in Bodrum. The translucent and deep waters of the Gulf on the southern shore of the Bodrum Peninsula vary from the darkest blue to the palest turquoise, and the coastline is thickly wooded with every hue of green. In the evening, the sea reflects the mountains silhouetted against the setting sun, while at night it shimmers with phosphorescence. One of the best anchorages is the splendidly scenic Akbük, hidden behind a forested promontory. The excellent cosy restaurants are as good a reason as any to linger for a tasty meal after an afternoon of snorkeling and diving. Sedir Island (ancient Cedrai) boasts an incredible beach with fine sand composed of fossils, and a splendid view of Kiran mountains across the bay. As you sail along the island’s southwestern coast, forests stretch out to meet the deep inlets of the bays. The jagged coastline, known as the Bay of Sixty-Six Inlets, seems to have emerged from the oft-told tales of pirates. The waters of the Gulf of Hisaronu lap the breathtaking shores that hold the legacy of both ancient and modern civilizations. At the end of the Datca Peninsula stands the ancient Carian city of Knidos, described by Strabo as “a city that was built for the most beautiful of goddesses, Aphrodite, on the most beautiful of peninsulas.” Famous as a center of art and culture in the fourth century B.C., the city had two harbors: one on the Aegean and the other on the Mediterranean. The remains of a circular temple dedicated to the goddess of love overlook remains of the two harbors; the arcaded way was built of white marble heart-shaped columns. The legendary Aphrodite of Praxiteles statue, reputedly one of the most beautiful sculptures of the antiquity, once graced this temple. The town of Datca has become a popular stop-over for yachtsmen, and offers many colorful seafood restaurants, pubs and discotheques. In the Gulf of Hisaronu is the peaceful Keci Buku Bay; the Bay Marina is rich in natural beauty: the surrounding mountains and forests, and the long “Kizkumu” (sunken “pier”), a natural sand formation. Leaving the Gulf of Hisaronu: hidden away in its own exclusive inlet is the town of Bozburun, famous as one of the gulet-building centers of Turkey. Loryma, at the tip of the Bozburun Peninsula where the ruins of the ancient harbor and castle remain, can only be reached by boat. Kumlubuk, a turquoise paradise, lies on the southern side of the bay; on the north side, above the water, stands the ancient Rhodian city of Amos. At Turunc a natural harbor opens out into a wide expanse of spectacular blue water. The next port is Marmaris. Marmaris Bay resembles a calm lake and offers ideal mooring for yachts. Ancient Marmaris, Physkos, was an important stage on the AnatoliasRhodessEgypt trade route. In the 16th century, Suleyman the Magnificent had a citadel built on a hill just beyond the harbor; today, its remains house the Marmaris Museum. Pine forests cover the mountains which surround Marmaris; on shore a white line of sand and rock separates green from blue. The beach areas sparkle, and provide visitors with a perfect opportunity to dive, snorkel and swim in relaxing conditions. Yachts and boats decorate the coast of this lovely tourist center where thousands converge to enjoy a funfilled, self-indulgent holiday. Those who surf and water ski will thrill at the conditions in Marmaris. Energetic entertainment at a lively bar, or dancing untill dawn at a sophisticated discotheque can end an ideal day. There are many good buys in Marmaris’ boutiques, colorful bazaars and markets. You can find excellent leather and suede goods, copper and brass wares, jewellery and objects carved of onyx. Turkish carpets, textiles and embroidery make good handscrafted souvenirs, and the locally produced pine-scented honey called “cam bali” is superb. The Marmaris Netsel Marina, one of the largest and best-equipped marinas in Turkey and the Marmaris Albatros Marina, one of the best for winteringand maintaining yachts, make Marmaris an excellent starting point for the Blue Voyage tour of the Aegean Coast. In May, the Marmaris Yacht Charter Show provides an opportunity to meet the captains and their crews. With plenty of provisions aboard, you set sail in the craft of your choice and languidly explore the spectacular beauty of southern Turkey. At Ekincik, a delightful yacht-mooring you can enjoy the breathtaking beauty of this area and the friendly hospitality of its people. Delikli Island lies right off the coast, southeast of Ekincik. Yachtsmen enjoy a change of pace when they anchor at the island and take a smaller craft excursion into the Dalyan Delta. The Delta, with a long, golden sandy beach at its mouth, is a nature-conservation area and a refuge for sea turtles (caretta caretta) and blue crabs. At a bend in the river, high on the cliff face above the fascinating ancient harbor city of Caunos, magnificent tombs were carved into the rock. From Delikli Island, sailing southeast, you arrive at Sarigerme with its pleasent holiday complexes, nestled in cozy pine forests. Yachtsmen will want to anchor at Baba Island, across from the pristine sandy beaches. The Gulf of Gocek, with the friendly Club Marina set in a beautiful pine forest, is one of the Mediterranean’s best sailing spots. Dotted with islands and indented with many coves, its land and seascapes are irresistable. The ruins of Arymaxa, an ancient city at the southern tip of the gulf, lie at the edge of the azure waters. Opposite on Tersane Island, stand Byzantine ruins,including those of the ancient shipyards. From the Gulf of Gocek sail on into Fethiye. The secrets of the ancient gods of mythology still lie hidden in the secluded coves and bays around the Gulf of Fethiye. This is truly paradise for those who want to sail through history. The resort town of Fethiye has an important marina and overlooks a beautiful bay strewn with islands. Above the town, called Telmessos in antiquity, numerous Lycian rock tombs, reproducing the facades of ancient buildings, were cut into the cliff face. Explore the Belcegiz Bay and the beautiful Blue Lagoon (Olu Deniz), where the calm, crystal-clear water is ideal for swimming and other water-sports. On Gemiler Island, Byzantine ruins lie tucked among the pines. Go ashore at Kinik (65 km from Fethiye) where the ruins of Xanthos, the ancient Lycian capital,lie in a splendid natural setting. At the holy Lycian center of Letoon, three temples dedicated to Leto, Apollo and Artemis, familiar gods of mythology, await the intrepid tourist. Mythology records that Apollo was born at Patara, a principal harbor of ancient Lycia, south of Letoon and Xanthos. The ruins are of course numerous and fascinating. Its twentystwo kilometres of pure white sand stretch as far as the eye can see, making it a natural choice for all types of beach sports. A short sail to the east brings you to Kalkan, a lovely small hilltop town that overlooks a tiny bay. Narrow, winding streets lined with souvenier shops lead down to the charming marina. Every morning, boats busily take tourists to one of the nearby beaches or small bays. As the sun sets, it is Kalkan style to meet on the roof-terraces for a drink before dinner, and enjoy the comings and goings of the yachts, the business of the marina and the panoramic view. Like most towns on the Lycian coast Kas lies wedged between mountains and sea. Kas, once ancient Antiphellus, still exhibits a few remains of the old settlement. An ancient theatre on Kas’long peninsula is within walking distance of the town. Kekova, “home of the sun”, is an island an hour from Dalyanagzi by sea, as well as the name of a whole ensemble of picturesque islands, numerous bays and ancient cities. These bays provide natural harbors in all seasons, and yachtsmen particularly enjoy exploring the unspoilt landscapes. Along the northern shore of Kekova Island, at Apollonia, earthquakes have disturbed the land causing some of the ancient houses to sink under the clear water, creating a sunken city. Kalekoy Castle (ancient Simena) offers a bird’s-eye view of the bays, inlets, islands and colorful yachts, sailing peacefully on the glassy water. The colors in a Van Gogh painting, blue skies, orange sunsets, starry nights,peace and tranquility, playful dolphins, mythological mysteries, and the sparkling sea- Kekova provides all this and more. At Demre (Kale), the ancient Myra, (25 km west of Finike), many splendidly carved rock tombs overlook the magnificent Roman theatre. St. Nicholas (Santa Claus) was the bishop of this Meditterranean city during the fourth century and died here in 342. An official entryport, Finike is surrounded by citrus trees and gardens. Thirty-two kilometers from the Finike Marina lie the remains of the beautiful and ancient Lycian city of Arikanda. This excursion inland, a mountain trek, rewards you with superb views, fabulous ruins and fresh mountain air. Slipping around the Kirlangic Peninsula brings you into the Gulf of Antalya. The first side you come to is the ancient city of Olympos, on the southern side of Mt. Tahtali(Mt. Olympos). Oleander and laurel bushes shade the Olympos Valley, which you can approach by land as well as by sea. Nearby at Yanartas (at a height of 300 meters), according to mythology the Lycian hero Bellerophon, mounted on his winged horse Pegasus slew the fire-breathing monster, Chimaera. Gas which seeps from the earth burns brightly at night. The Byzantines also considered this place a religious area. Alexander the Great’s favorite winter resort was at Phaselis, the famous ancient commercial harbor north of Olympos. From the south of the harbor, look up at Mt. Tahtali for a spectacular view. Sail on to Kemer, a resort town carefully designed to blend in with the surrounding scenery, that offers an ideal environment for a wonderful holiday. The fully equipped Kemer Turban Marina has facilities for all activities so that yachtsmen can enjoy the unspoilt bays and beaches south of the town. Shoppers will delight at the wonderful range of high-quality souvenirs. April is the month of the colorful Kemer Carnival. 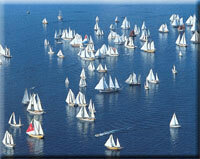 Also in the spring are the yacht races between Kemer and Girne in the Turkish Republic of Northern Cyprus. Sailing around this coast towards Antalya will give you a glimpse of some of Turkey’s most modern and luxurious holiday villages. Antalya, Turkey’s principal holiday resort city on the Mediterranean, embodies the contrast between the majestic coastline of beaches and rocky coves, and the towering Taurus Mountains. The ancient Attaleia, named after King Attalus II of Pergamon, Antalya was founded in the 2nd century B.C. Today palm-lined boulevards, beautiful parks, historical buildings, monuments, museums and the picturesque old quarter Kaleici, (with the Kaleici Turban and Leisure Center, which has won several awards, is considered one of the most beautiful marinas in Turkey; Setur Marina, the other marina in Antalya, is, on the other hand, quiet and peaceful; but both welcome yof after your unforgettable voyage in the turquoise paradise of Turkey’s water.